I was a pretty late adopter of cell phones. I don’t really like talking on the phone, and phones at the time were just that – a bit big and clunky, nothing like the smart phones of today. They didn’t have games or any other distractions. I finally gave in to the cell phone trend when I moved away from home to go to college. My Mom insisted I needed one since I was moving to a larger city, as a safety measure. I got a “Pay as you go” type and hardly ever used the minutes on it. Moving to the city was in itself a transition for me. I came from a town of about 70,000 people and moved to my city just as it was marking its millionth citizen. It’s not the biggest city, but it was a pretty large adjustment! As I made my way around my new city, exploring the downtown, taking the train and the buses, I was struck by a feeling: No one knew where I was. This wasn’t a scary realization, rather, it was liberating. In my old town, you couldn’t go to the grocery store without running into at least three people that you knew. This used to drive me crazy, especially because my mother worked at a school and knew hundreds of kids and their parents. It used to irritate me because I just wanted to go through the cereal aisle or whatever without having to always stop and chat. In my new city where I knew so few people, I could have a coffee, go draw in the botanical gardens, spend hours wandering around on my own and no one would bother me. I loved it. I still carried my cell phone with me. But my distaste for it was driven home after an altercation with my father. Frustrated that he couldn’t reach me, he complained: “You never answer your cell phone! What’s the point of even having it?” I told him in no uncertain terms that I had a phone for emergencies and in case I needed to reach anyone. It was not a guaranteed way to get in touch with me. I wasn’t going to be at anyone’s beck and call. This was over ten years ago, mind you. Since I first reluctantly brought my clunky phone in my purse, smart phones and constant internet access have become an expectation. Twitter, e-mail, text messages, Facebook messages, instant messages and cell phones give people almost immediate access to each other. The introduction of Real ID into the Blizzard family of games lets you play with all of your friends – and don’t get me wrong, I think it’s fantastic. But there are a few drawbacks. The stoic refusal to introduce an invisible mode into Real ID (and now, I assume, Battle Tags within Diablo) has been a constant thorn in my side. Like when I first explored the city unattached, sometimes I want to play a game without someone knowing where I am. Suppose I wanted to roleplay on another server for awhile – all of my Real ID friends can see my character name, server, and zone. If I want to login to my bank alt and just spend some time auctioning, everyone can see that too. Even if I just want to make a silly lowbie alt and play quietly by myself, I can’t do that. I’m far from the first person to bemoan the lack of an “invisible” mode with Real ID. The counter-argument is, “Why are you playing an MMO if you don’t want to talk to people? Just don’t use Real ID if you don’t want anyone to bother you.” But that seems really ridiculous to me, and overly simplistic. A person might go to a coffee shop by themselves in real life and read a book or just sit. It’s not expected that anyone will just walk up and sit at their table and talk to them. “But why did you go to a coffee shop if you didn’t want to talk to people?”At another time, you go to a coffee shop with a friend to chat and catch up over a hot drink. You shouldn’t have to choose that you ALWAYS want to go for coffee only with friends, or that you always want to go for coffee always alone. If it wasn’t for Real ID, I wouldn’t be able to run five-mans and raids with friends from other servers and factions. I love Real ID. But there are times when I also hate it. Because solitude doesn’t necessarily have to be anti-social. There should be room for stillness in every day life. There’s nothing wrong with wanting to be alone sometimes. I really struggle with this because I get messaged a lot in Real ID. And the people I have in Real ID are my friends, so it’s not that I don’t want them there. But sometimes I just don’t feel like talking – and this even applies in real life. Voss knows more than anything, because he is more extroverted than I am. Sometimes I’ll be reading something quietly and he’ll be talking to me and after a few minutes of “Mmhm,” or me not responding he’ll say wryly, “You’re ‘peopled’ out, aren’t you?” He’s usually right. Being social takes energy from me. It’s possible to overdose on it. At those times, I really wish that Real ID had an invisible feature. It’s possible to manage your status with “Busy,” and “Away,” but that requires that people pay attention to your status and also respect it. It can be hard to tell a friend, “I just don’t feel like talking now,” without hurting their feelings or making it seem as if it’s something to do with them. Now that I’m adding Battle Tags in Diablo III, it’s my understanding that the tags will carry over to the Real ID system in WoW, and I’ll be honest, I’m wary. I’m not quite sure why I need to be able to connect to Battle.net to be able to just play Diablo by myself (as sometimes, I am going to want to do just that). Don’t get me wrong, I’m excited to be able to play with a wider range of people than I had available to me on Real ID. I’ve met so many great folks via blogging and Twitter that I’d love to game with. But if I have you on either of those systems, don’t be surprised if someday I’m set to busy and I don’t respond to your messages, or I don’t tweet back at you right away, or immediately answer your e-mails. Sometimes I may deliberately let my phone go to voice mail, close my Twitter client, and sit quietly by myself. Since the days when I played Super Mario Brothers and Bubble Bobble, gaming has been an escape for me. I could sit for hours and play – and sometimes I’d play for hours with my Mom or a friend, too! I love shared gaming experiences, and I love solitary ones. With our current expectations of connectivity, it can seem radical or selfish to say “I’m not available at the moment,” but trust me – sometimes everyone needs a little space to get lost in the world, virtual or otherwise. Diablo III seems like it’ll be a blast to play with other people, and also solo. I promise to respect your “Busy” tag if you’ll respect mine, since it doesn’t seem like invisibility is on the horizon anytime soon. It’s been quiet around here because generally things with me have been status quo. I raid with BT once per week on our “new” casual schedule, and enjoy it a great deal. I play WoW on the other days when I feel like it, but otherwise all of my management responsibilities have been greatly reduced. I don’t have to stress out about performance or progression because we aren’t pushing for it like we used to. I hope the rest of the guild doesn’t mind, but if anyone does mind they haven’t mentioned it to me! On the contrary, the past month has seen an explosion of guild activities, more than we ever had before outside of raiding. There was a brief lull after we slowed our pace, and then all of those free raid days began to fill up with other activities organized by other people. There’s an arena team that runs Tuesdays, people run BGs together a few times a week. I started a Firelands run on Saturdays which is a whole entry unto itself, and Fsob has been organizing what he dubbed “MMLA” runs (you heard it here first, people). That is: Mounts, Mogging, Legendary and Achievement runs. Because Real ID now allows for grouping up to do old content, we’re no longer limited by the number of people available to us. These runs started off small – a concentrated group of BT people and a few friends doing Sunwell, Black Temple, etc. But the changes to Real ID have allowed it to explode into almost an entire group of people running Ulduar 25 for achievements, a shot at Mimiron’s Head, transmogging gear, and meta-achievement drakes. A few people even brought characters locked at level 80 because they need the gear to eventually do a Herald of the Titans run. I was thinking about something as we were doing Ulduar last night, hanging out on Mumble and “meeting” some of the people I’ve known via Twitter for a long time. 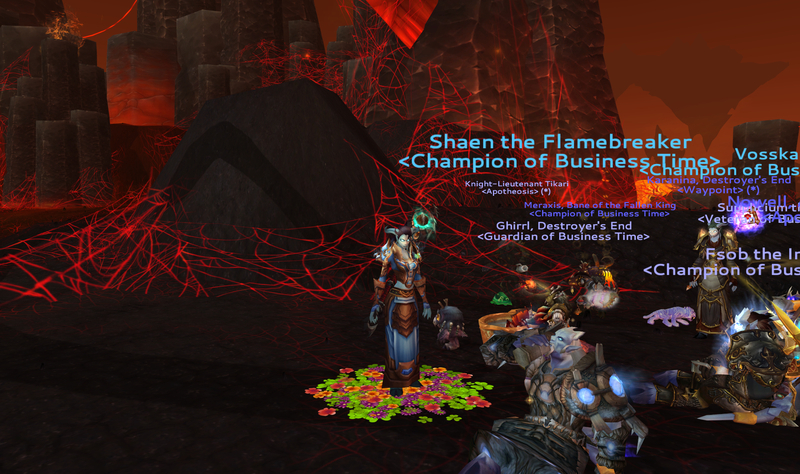 Business Time’s footprint is small – I mean, we are a small guild, kept that way intentionally. We have maybe twenty members, tops, at any given time. (Probably less). But our reach is wide. Through Twitter networking, blogging, and runs like Fsob’s run, we interact with a great many more people than our small guild size would seem to suggest. The fact is, the guild we are in almost doesn’t even matter anymore, and will come to matter even less after Battle Tags are implemented. Think about it. 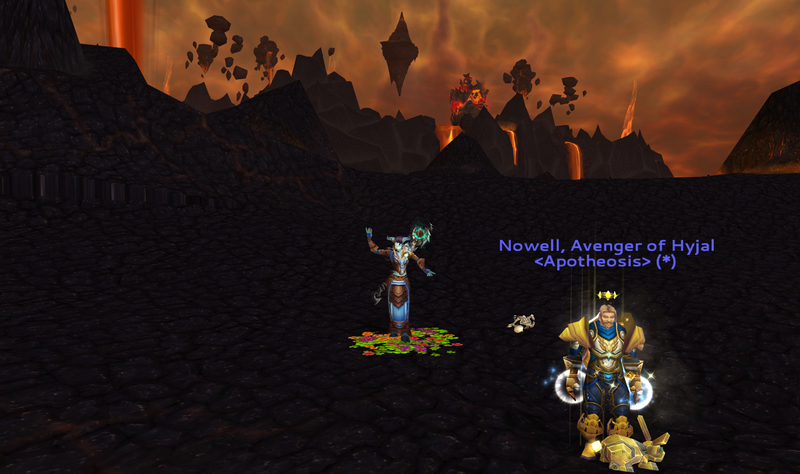 Via Real ID, I have been running Firelands with a holy paladin from Apotheosis for a month now. We were friends before, but now we also raid together. Likewise, the guild leader of Waypoint on Medivh has been running with us each Saturday. Last Saturday we brought Tikari (also of Apotheosis). Now of course, Nowell and Tikari are still members of Apotheosis, and Karanina is the guild leader of Waypoint. But what are they to me, and what is BT to them? It’s not exactly nothing. You might call them “friends of the guild.” If they wanted to make an alt and hang out in BT, I would absolutely say yes. 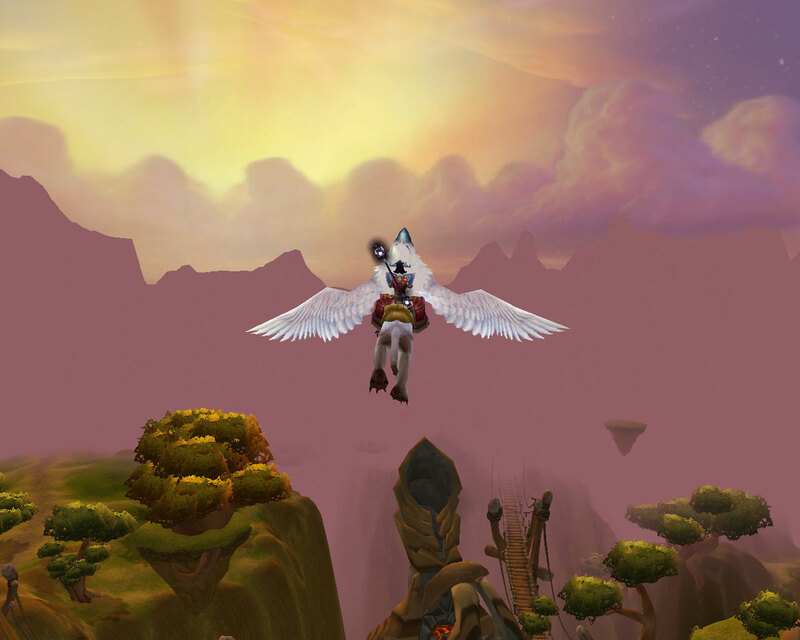 The bonds of friendship online, in a game like Warcraft, are forged through three things: communication (via text), communication (via the spoken word) and shared experiences. I’ve been raiding and talking to all of these people once a week for a month now. I raid with my guild once a week. So how do the two groups differ? I think in many ways, they don’t. The most important and key way, obviously, is progression raiding. Apotheosis is raiding hard-mode content with a group of 25 people. Their policies and involvement may differ considerably from Business Time’s. But in the space that we intersect, we get along famously. I also cannot overstate that this is absolutely the best thing that could possibly happen for guilds of any size or goal. Guilds have typically been (largely) insular operations. You have your own guild chat, you have your guild events, you may sometimes invite “outsiders” along but generally it’s all about what happens within a guild. Thanks to the new connectivity between guilds, this mentality has been exploded. Small guilds (such as ours) can tap into a much larger resource of players. The challenge to keep your guild engaged and interested has just been greatly reduced! It used to be that I worried if I wasn’t online every day, or I worried if we didn’t have enough events being planned outside of raiding that people would get bored, or stop logging in, or even leave. I imagine that other guild leaders may have the same fears. It’s tough to maintain a community of people when everyone has commitments outside of playing a video game. Especially in smaller guilds players can be like ships passing each other in the night – never even seeing another soul online for hours at a time. That may still be a true, but an influx of organized activity that members can participate in keeps people happy and engaged. As far as I’m concerned, there is no downside to this at all. I get to meet and raid with friends that might not necessarily share the same progression raiding goals as I do, and we don’t have to be in the same guild, but we still have a good time! It also means opportunity for everyone involved. Cross-pollination of guilds widens the community, and bridges the gulf that’s always existed between isolated guild communities without impacting the singular goals of the guilds themselves. Thanks to the contribution of these folks, I am making progress towards building a Dragonwrath. Yes, I decided to go ahead and get it done, no matter what it took. That wouldn’t be possible without the help of these friends. We usually have a critical mass of BT players each week, but are just 2-3 people short of a “guild” run. To me, it’s been pretty amazing. We’ve been doing heroic modes and having a blast. I think everyone has fun. (Although ask them how they feel in a few months…) On the flip-side, Val’anyr shards have been going to Jasyla in the Ulduar 25 runs. Somehow it seems “right” to me that our guild members can help her build a legendary while some of her guild members are helping me build one, too. I’m not a member of Apotheosis, and they aren’t members of Business Time, but as I said – we aren’t nothing to each other, either. Meantime, I haven’t even touched on the raiding communities that have sprung up as a result of this Real ID change – people who want to make cross-server raiding their primary game activity! The guild that you are in at that point matters even less, because there is not likely to be a “central” guild organizing an event, rather it’s an individual bringing together raiders from all over. It’s radical to suggest that you might not even need a guild to enjoy raiding content, but with Looking For Raid and cross-server raiding, that has very quickly become our reality. So where do we go from here? Let’s break down even more barriers. I wish I could group with people from the EU. I wish I could raid with my cross-faction friends. Let me invite friends from other servers via the in-game calendar! Consolidate these things so I am spending more time in your game. Let me offer guild repairs for everyone in my raid, the same way I can drop a feast and provide flasks for them. The final one, I’m a bit more trepidatious about: the ability for Real ID groups to join raids for current content. If that one becomes a reality, your guild tag really might cease to matter in a way that’s dangerous for guilds, although it might also really help to be able to fill a raid last-minute with a friend. The structure of guild and group play in WoW has been fundamentally altered. I’m not quite sure where it’s heading, or where Blizzard will draw the line, but for the time being I am pretty happy about it. The recently announced Scroll of Resurrection plays into this too. Characters and guilds and play are ultimately malleable at this time. It’s as easy as snapping their fingers for Blizzard to create a level 80 character, to race/faction change a character, and send them to whatever server they want. All of this is accomplished usually in a matter of minutes – I know, because I’ve poured money in that direction before. Now that the floodgates have been opened to allow us to play together, I predict that people won’t be content to stop there. We’ll probably see current content Real ID raiding, guild raiding coalitions, possibly even guild mergers. (It’s possible to server transfer a guild now, too!) More and more, we’re going to be playing together however much we want to be. So how about you? How have the Real ID changes impacted your gameplay? What do you think about the “new” social reality of World of Warcraft? It's me! With Walks! Neither of us are actually blood elves, but we do a good job of pretending. You may have heard that Blizzard planned to roll out some changes to the Real ID system to allow you to group with your friends from other servers. Ignoring the whole debate about whether this should be a paid service or not – I am so freaking happy about these changes! I can’t even tell you. Actually, no. Let’s do it. Let’s face that number. That’s nine changes, I think they all cost $25 USD. That’s two hundred and twenty-five dollars I have basically wasted with my indecisive attempts to spend time with friends. It’s a lot of money! But let’s take a closer look at my reasons for doing it. I wanted to have a Horde character. I wanted to have a Horde character on a friend’s server (two different friends, one of whom stopped playing, thus the extra transfer). 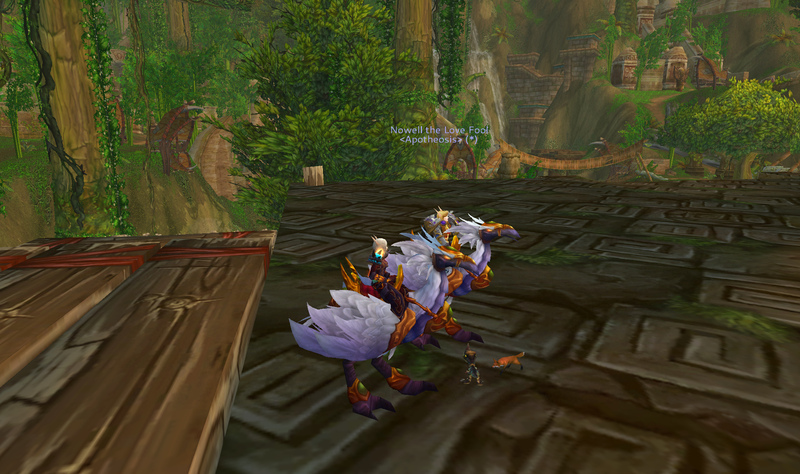 Then I wanted to have an Alliance character to help out some other friends, on another server. That’s a pretty strong trend here. I wasn’t just doing this on a whim, it was because I wanted to hang out with people who don’t live on my server. The problems I encountered while leveling alts on other servers are numerous. When my friends weren’t around I was bored or lonely because I didn’t know enough people there. LFD was demoralizing. I couldn’t manage to make money (some servers have an odd economy). I didn’t have access to the resources I ordinarily would and so everything was a struggle. Sometimes that kind of adversity can be fun, but mostly it’s frustrating to me. I don’t want to make a huge venture out of becoming self-sufficient on a secondary server when I spend plenty of time playing and working on my main characters already. We all have a limited amount of WoW time. So I look at it this way. Should the Real ID grouping feature be a premium, paid service? Obviously, I’d like it if it wasn’t. It’d be nice if it was just included with your subscription. But even if it costs $5 a month (and I think they’re talking about more $3-$4), it would take 45 months of paying for it before I’d equal the amount I’ve spent on server and faction changes. That’s almost four years worth of premium subscription. What is my time worth to me? Because this way, to hang out with Horde friends and run a dungeon, I can level a character on my home server. With access to heirloom items from head-to-toe, the time commitment is much less. I can run a leisurely dungeon with my Horde friends if I feel like doing that. Or like we did last night, I can invite a friend from another server to finish off a five-man. 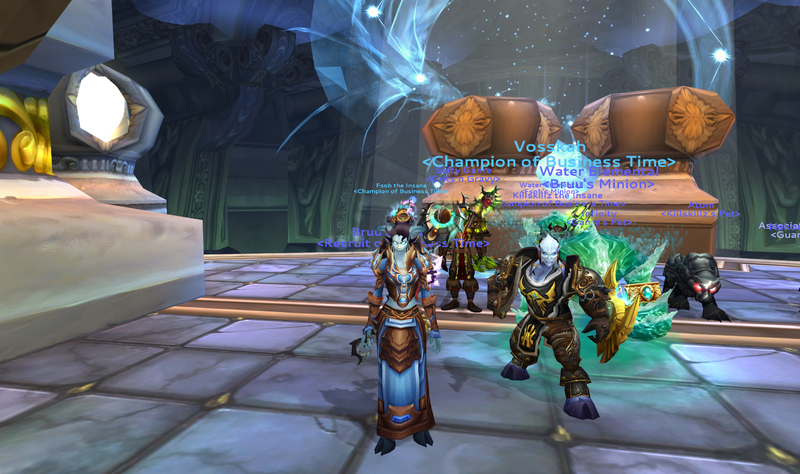 That screenshot above is from a ZG I ran with three guildies and my good paladin friend, Walks. I know he thinks I’m crazy because I kept enthusing the whole time. “I’m so happy about doing this! I’m so happy you’re here!” I’m serious, too! It’s as if we were “meeting” for the first time. We’ve chatted and been friends for ages but we’ve never once been able to do anything together other than chat. This new feature changes that completely. It basically means the end of LFD for me if I can help it. All of the awesome WoW folks I’ve gotten to know can now get together and do a dungeon together! (If they happen to be playing the right faction, anyhow, but “cross faction Real ID grouping” is a whole other can of worms). This basically makes it so that all of our guilds suddenly got a bit larger, a bit more flexible. Server-transferring to join another guild? You can still hang out with your friends from your old guild and run a five-man from time-to-time and keep in touch. Don’t want to deal with LFD? Perhaps you have a friend on another server who is just farming herbs and would love to join you and your guildies. Or maybe they need one more person for their own run! Whichever way you look at it, if you use Real ID and have any friends on your list, the Warcraft universe just got a bit smaller (or larger). In case this wasn’t clear, I’m thrilled about it, and it’s a fantastic change for me. Being in a smaller guild, there aren’t always a ton of people online depending on the day and time of day. Sometimes I play at odd hours and would still like to run a dungeon. This is going to be game-changing as far as I’m concerned. I’m also of the opinion that Real ID raid grouping isn’t too far behind, but I could be wrong, hopefully BGs too! If the social aspect of Warcraft is what keeps you playing, make no mistake – this is huge for you. It’s a feature that is worth its weight in gold to me, too. I’ll happily pay $5 a month to spend time with my friends from different servers. It’s much better than $225, and getting to play with folks I’ve never been able to really play with before? You can’t put a price on that as far as I’m concerned!